Matt Hancock, creator of Aethertone custom guitars has started his own blog -- http://aethertone.blogspot.com/ -- and I'm definitely staying tuned! Matt has customised three guitars so far, but hey, he's only been at it for a year and a half. But anyone with an eye for detail can immediately spot the amount of painstaking work he puts into his art -- from the faux burnished metal plates to the hundreds of painted-on screws that appear, uncannily, to be almost 3-dimensional! 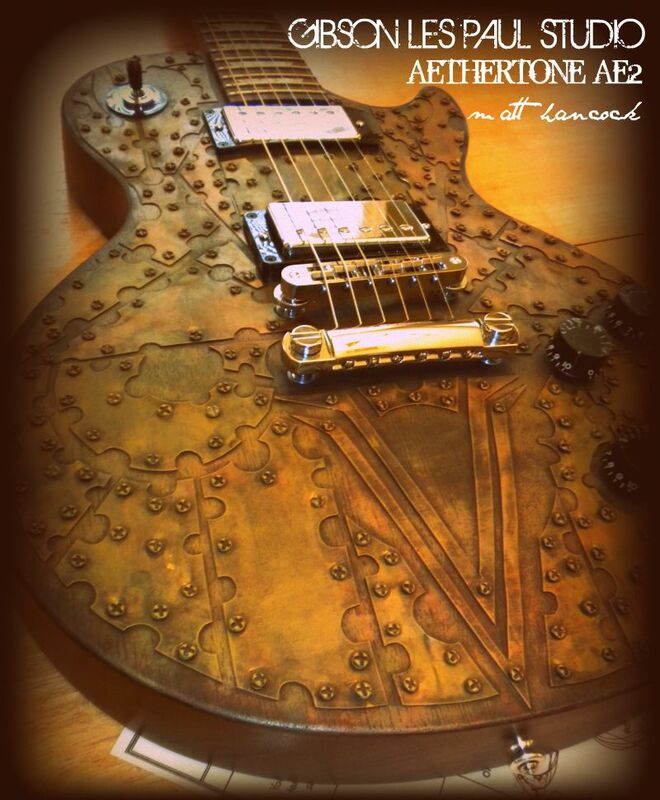 His second project -- a Steampunk'd Les Paul Studio is featured in this pic. Check out my earlier post on Matt's Aethertone AE1 Stratocaster here. An Epiphone SG...the "EVANGELINE" - go check it out! It's for sale!! !